Some common questions about Tack Coat. Tack Coat to put it very simply is asphalt glue used to hold two layers of asphalt together. When a new layer of asphalt is installed over an existing layer of asphalt or concrete a bonding agent is needed to make sure the two layers stick together. In the State of Massachussetts the material used is an asphalt emulsion that is rapid setting tack coat. 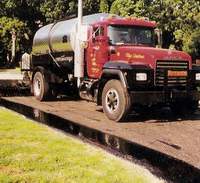 Liquid asphalt is mixed with water, held in suspension in the water so it can be sprayed on the existing surface in the proper concentration. The water dries out, then when hot asphalt is put down over it the hot tar reheats the tack the layer of liquid asphalt forms the bonds to hold the two layers together from slipping. When asphalt is made all the agregate has liquid cement coating all the agregate so it will stick togehter. So when a new layer is installed the old layer has to be coated with asphalt cement so there is a bonding agent to hold the layers together the same as the mix is held together by asphalt cement. What is tack coat used for? Tack Coat is used to construct a durable pavement surface. Asphalt for paving is not liquid enough to stick to a previous layer. So the aditional asphalt cement is needed to prevent the new and old layer from slipping. The forces of traffic starting and stopping on the pavement will move the new layer if not glued together. What is the purpose of a tack coat? It is to create a bond between two pavement layers. A layer of asphalt over concrete or asphalt will not stick firmly with out tack to glue the layers together. It is sort of like a wedding cake with too much strawbery filling in the layers, the layers tend to just slip off. Instead of toothpicks to hold the layers tack holds the asphalt in place. This need for bonding layer is the whole basis of our business. 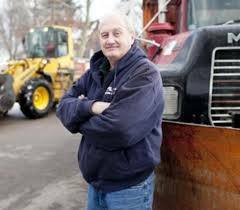 It has to be applied efficiantly so the trucks can get the asphalt to the paver and the paver can get the tonnage placed since that is the way they get paid. Not by waiting and delays in the process. What is tack coat made of? Tack Coat is made of two main parts. The asphalt cement is the glue to hold the two layers together. It is very thick and sticky. If too much is applied it can create a failure plane. The two materials are just like oil and water. They do not mix, so an emulsion has to be created. The asphalt particles are ground very finely in a coloidal mill and a dispersal agent is used to hold the particles in suspension so they do not settle out of the water. There is a whole science behind making it work right. What is a tack coat for pavement? What is bituminous tack coat? The term tack coat can refer to a number of products both in and outside of the paving industry. The question of “what is bituminous tack coat?” is an attempt to focus on paving related products. Looking up the term bituminous is defined in webster.com as having two meanings. in this case the realated term of bitumen helps to focus the meaning for this term merriam webster says bitumen is one of two meanings. So what this is all getting at is looking to be clear in the meaning that the term is about a material tack Coat that is not coal based. There are a number of types of tack coat so this term applies to all varieties. The one Riverside Asphalt mainly deals with is RS-1. In Massachusetts the term bituminous is not used a real lot but we wanted to include it here for referance for those who run into it. People searching for tack coat can stumble on the term regarding tack coat in painting. It is instructional in that it refers to being sticky. Certainly asphalt based tack coat is sticky and almost impossible to get off some materials. In painting when thick paint layers are needed like on a bridge to protect it from rust one coat is put on, let it set up and get sticky then a second layer is put on. This allows for a thick coat that will not run and sag if they went for that thickness all in one application. Talk about sticky we know of a contractor in CT that had a leaking hose and a white convertible with white interior went by and got sprayed inside with tack coat. What a mess, the good news is a body shop found a material that would take it out and not ruin the upholstery. Pretty incredible. What does tack coat breaking mean? Breaking does not mean the tack is failing it means the water in the emulsion is evaporating. This can be seen by the color change. Fresh tack just applied has a brownish look. As the water evaporated the remaining asphalt cement is more visible and has the typical shiny black look. It is less fluid stickier and blacker. If hot asphalt is right on the fresh tack it will steam up due to the higher water content present till it “breaks”. Where to apply tack coat? Where to buy tack coat in Massachussets? Where to buy tack coat depends on how much tack you need and what type you are looking for. Home Depot sells single five gallon pails of tack that is SS-1H-Tack-Coat a slow setting tack for patch repairs for the home owner market. We also sell pails and pallets of tack coat RS-1 for paving contractors. For people near by it is picked up at our yard or shipped by the pallet in the New England area. For large volumes a company like ours sends a distributor truck to spray the material for the contractor on a roadway or parking lot. Where does tack coat come from? The production of tack coat is a from the oil industry. It is a by product of refining oil and is pulled out of the process since road builders must have this bonding agent in order to finish the roadway with a durable pavement. So niche producers located regionally are set up to produce tack coat and they are getting the bulk source from the large refineries. These tack producers deal in large volumes such as tankers and huge tank farms that then ship out many tracktor trailer loads of 6,000 gallons each a day. When is tack coat applied? Any time two layers of pavement are being constructed that needs to be durable. Exactly when is tack coat applied? When is tack coat required? The requirement for tack coat is usually established by the project engineer in the specifications for the paving project. In other cases, it may be the city or town and the town engineer or similar person would call out the need for tack coat between paving layers. For other applications, it could be the property owner in the case of a parking lot. How to apply tack coat? For some small asphalt patch repairs sometimes it is broomed on to treat vertical surfaces. Typically it is sprayed from some size tanker or truck it is heated before application so it will break quickly and every effort is taken for the operator to be as far away as possible when handling the material since it can make such a mess on clothes and protective equipment and also is easily transferred and tracked around. How to remove tack coat? The short answer is you don’t. Avoid it at all costs. Gloves are disposable and need to be kept separate. Separate shoes are kept aside just for that purpose. One way to get it off pants is to take them put them in a 5-gallon bucket soak with straight simple green. Let them sit for some time. Rinse them in the bucket with fresh water and some dishwashing soap, then sneak them into the washing machine when no one is looking wash and dry them separately. Do not spill it on anything of value. Still need help? Please Send us a note!